My wife and I have become quite the travelers these past two years. In April 2010, we went to Hawaii. In June 2010, we went to New York. In July 2010, we went to Fort Hood, Texas. In March 2011, we went to Cincinnati, Ohio. In June 2011, we went back to Texas. I even got book time in on some of these trips, which I will include in a future blog post. I had thoughts of taking a side trip to Booked Up in Archer City, Larry McMurtry's town of books, when we visited our oldest son Todd last year in Fort Hood Texas; but Archer City looked just a bit too far on the map for this travel-wearied bibliophile. We made it there this year! We went to Texas to attend our oldest grandson Justin's High School Graduation Ceremony. That's Justin above. No more pencils! No more books! That's me below. Don't need any pencils. Just need more books! It took Linda and I about four hours to drive from Fort Hood to Archer City. We arrived about 1 PM. Building No. 1 is where the rare books are in Archer City. There are also Building Nos. 2, 3, and 4, and an annex, each housing different genres of books. I browsed some of the hundred-dollar-plus rare books in Building No. 1. Then I walked across the street to Building No. 3, browsed the 18th and 19th Century Fiction, and then concentrated on the Pamphlets Section: rows and rows of bibliographies, bookseller catalogues, auction catalogues and fine press pamphlets. I could have spent a week in that building alone, and will spend a day or two in there on my visit next year. More on that later. When I got done browsing I put one book and one pamphlet aside to buy the following day. We left Archer City before 5 PM, and got a room for the night at a La Quinta Hotel in Wichita Falls, about twenty miles to the north. My twenty-three years in the Air Force, served in my younger days, earned us a military discount! Linda and I then went to the mall and walked and walked––it's too hot to walk outside in Texas. According to the reading in my Saturn Vue, the outside temperature in Archer City was 116 degrees. We ended up at a Books-A-Million bookstore in the mall, because the cheapest fiction book my wife could find in Archer City was twelve dollars. Our first stop after breakfast the next day was the Mansion II Antique Mall in Wichita Falls. Besides book time for me, I wanted my wife to get some antique time in as well. The only drawback to going to Mansion II was that it didn't open until 10 AM. But the place had 2,500 books! Surprisingly, I didn't find any books I "had to have." But the proprietor told me that Three Dog Books & Alley Cat Collective right next door had books about books. Small world! On the Booked Up website there is a link to "visit our friends at Three Dog Books." Come to find out that Julie Ressell, one of the Three Dog Books owners, worked at Booked Up for years. 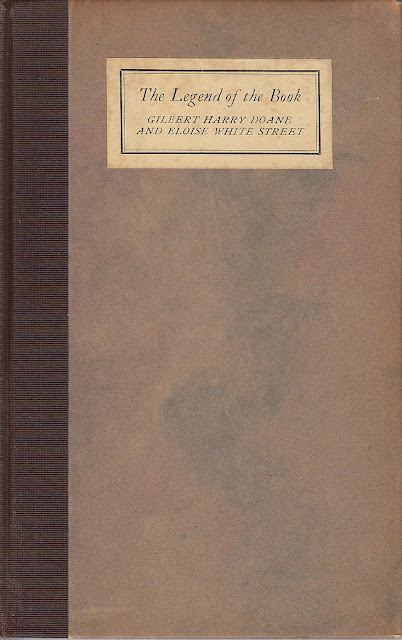 The Legend of the Book by Gilbert Harry Doane and Eloise White Street, Chicago: The Bookfellows, 1924. "The Legend of the Book by Eloise White Street and Gilbert Harry Doane is the tenth volume in The Little Bookfellow Series. Mr. Doane is Bookfellow No. 2438. It is illustrated by photogravures of a series of mural decorations by John W. Alexander in the Library of Congress entitled, 'The Evolution of the Book.' Altogether it is a very booklie legend. Three hundred copies of this first edition have been printed by Luther Albertus Brewer, Bookfellow No. 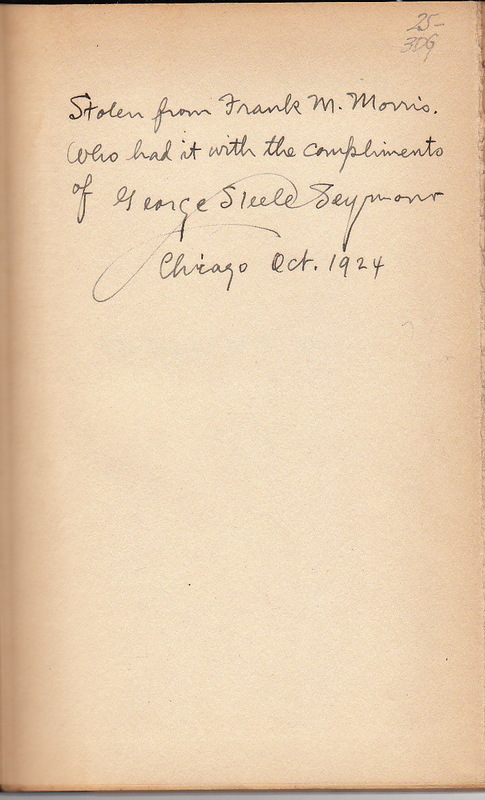 14, at his Torch Press in Cedar Rapids, Iowa, September, nineteen twenty-four." 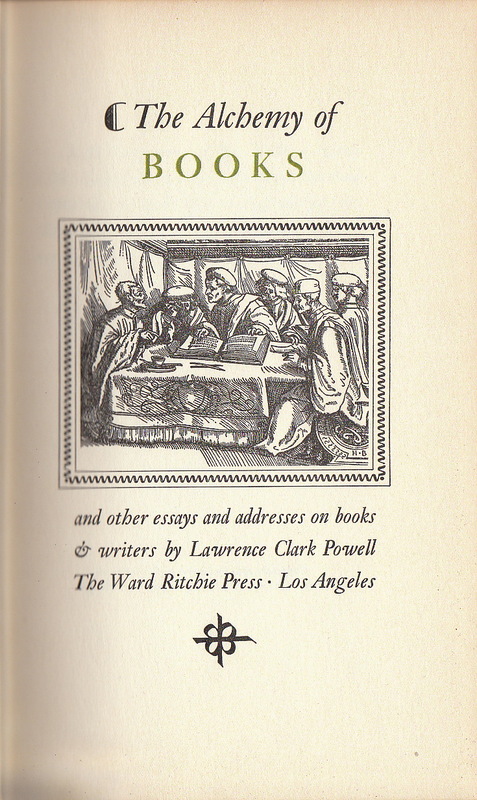 William Caxton & His Work: A Paper Read At a Meeting of the Club of Odd Volumes in Boston, Massachusetts in January 1908, With a Letter From the Author by George Parker Winship, Berkeley: The Book Arts Club, The University of California, 1937. 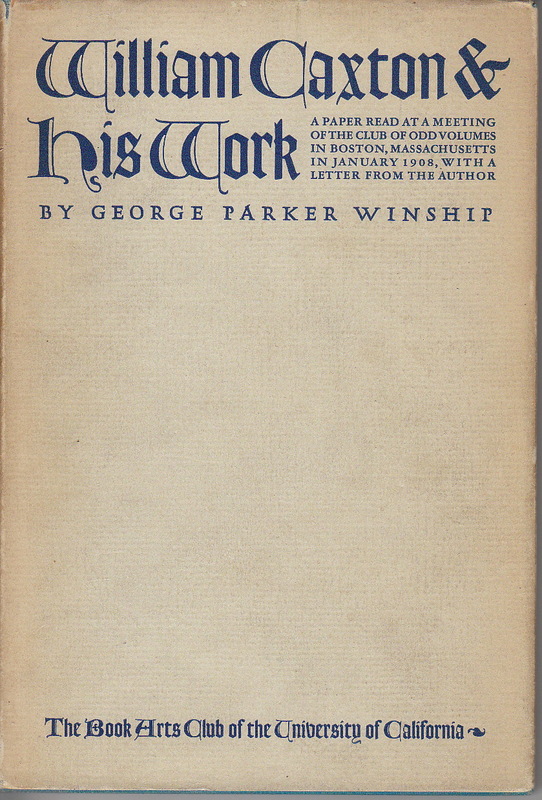 George Parker Winship talking about William Caxton? I had to have it! 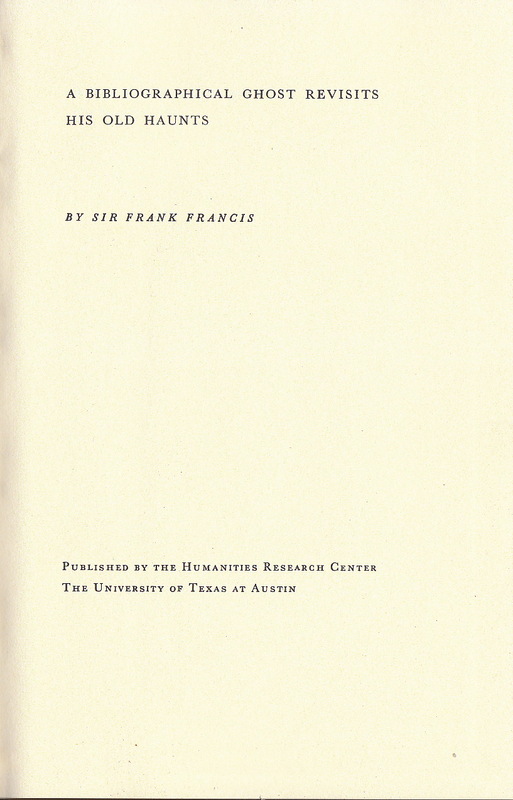 A Bibliographical Ghost Visits His Old Haunts by Sir Frank Francis, Austin: The Humanities Research Center, The University of Texas at Austin, 1972. Sir Frank Francis (1911-1988) was the librarian of the British Museum and a lecturer on bibliography. He was Secretary then President of the Bibliographical Society. In this talk, Francis ponders new and old techniques in the world of bibliography. The Alchemy of Books And Other Essays on Books & Writers by Lawrence Clark Powell, Los Angeles: The Ward Ritchie Press, 1954. Some of the essay titles made me buy this book: "Book Hunting in Britain. In Praise of English Books. Antiquarian Booksellers in England. A Bookman's Credo. On Reading and Collecting. Librarians as Readers of Books." And finally, "Books, People and the Earth on Which We Live." 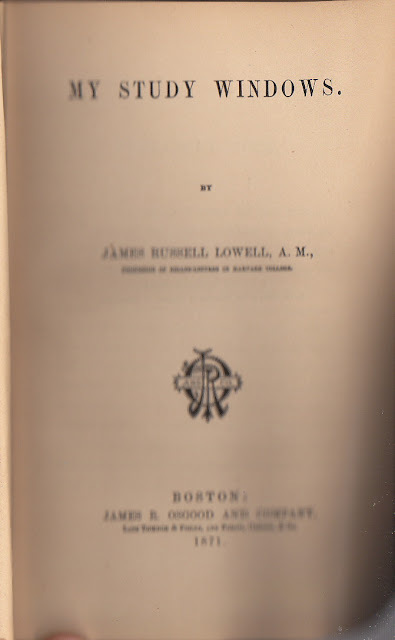 My Study Windows by James Russell Lowell, Boston: James R. Osgood and Company, 1871. 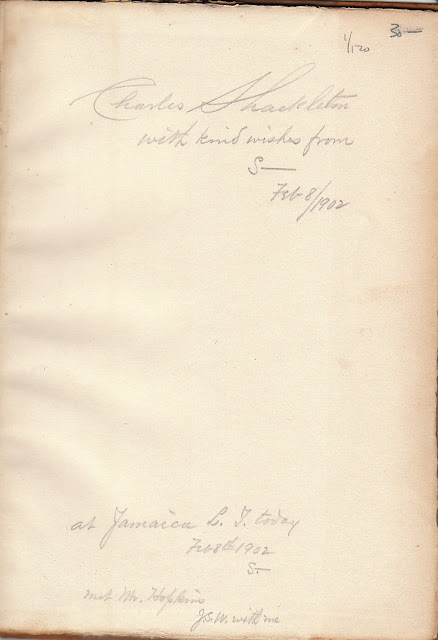 I have a Shakespeare book in My Sentimental Library from Lowell's library (inscribed by James O. Halliwell-Philipps), a biography of him, and a book which includes a tour of his house. I thought I should have at least one book written by him in my library, and this one looks interesting. The antique dealer at Mansion II also recommended that we visit an antique mall in Burkburnett, Texas, right near the Oklahoma border. Even though we would be going in the opposite direction from Archer City, I was still willing to go because my wife hadn't found any antiques at Mansion II. Mistake! The Burkburnett antique dealer had two strikes against him as soon as we took our first steps through his doors. First, he was smoking. And second, he was listening to Rush Limbaugh! Florida is a smoke-free state. Too bad Texas isn't. And Texas was hot enough without listening to hot air... Finding nothing of interest in Burkburnett, we drove south to Archer City. We arrived in Archer City a little before 1 PM. Booked Up would be open until 5 PM, leaving me only four hours of book time. But the only cafe in the town was closing at 2 PM, so we decided to grab a quick bite to eat. Another mistake! The place was crowded with cowboys. We ordered our food a little before 1 PM. We were still waiting for our food at 1:30 P.M. My wife was fretting because she knew I wanted to get to the books. Our food finally came (it was good) and I was at the register paying my bill a little before 2 PM. I was reading a notice near the register about Larry McMurtry's wedding, when the cashier said, "That's Larry over there," and pointed to a couple sitting at a table across from the register. Larry McMurtry had married Faye Kesey, the widow of his friend Ken Kesey the writer the same day as the Royal Wedding, but was going to have another ceremony in Archer City. I went over to their table and said to them, "Congratulations on your wedding." Then I went straight to the books about books in Building No. 4. The bookstack on the left in the image below is where the books about books were, eight rows high, from floor to ceiling. I saw a lot of my favorite books about books, but I also saw a lot of books about books I had never seen before. I went to the next row over, retrieved the ladder stand and rolled it to the books about books section. I was methodical. I looked at every spine of every book on every row, opening the books I thought interesting. 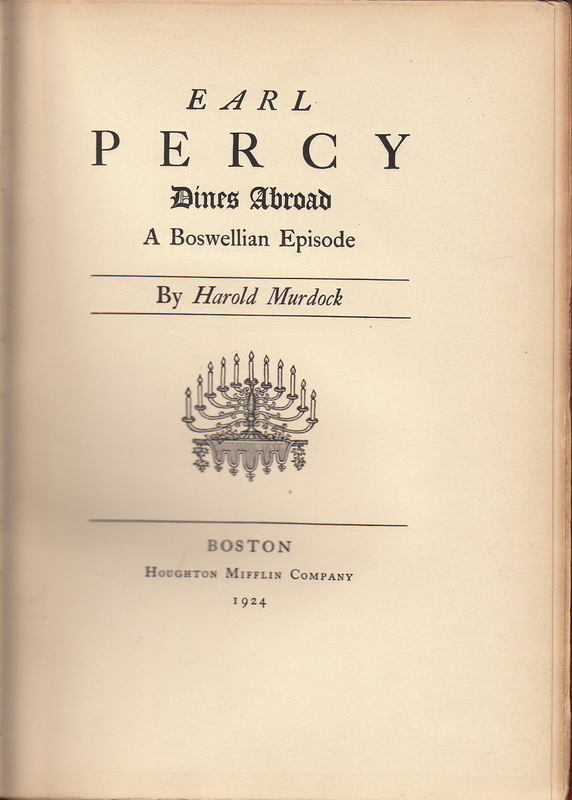 What I was primarily looking for were association copies for My Sentimental Library, books that because of their association would make their purchase at Booked Up worthwhile. Even with the twenty-five percent off sale, the books were still pricy. But then, I was in Larry McMurtry's version of Hay-on-Wye, book heaven. 1. Earl Percy Dines Abroad: A Boswellian Episode by Harold Murdock, Boston: Houghton Mifflin Company, 1924. 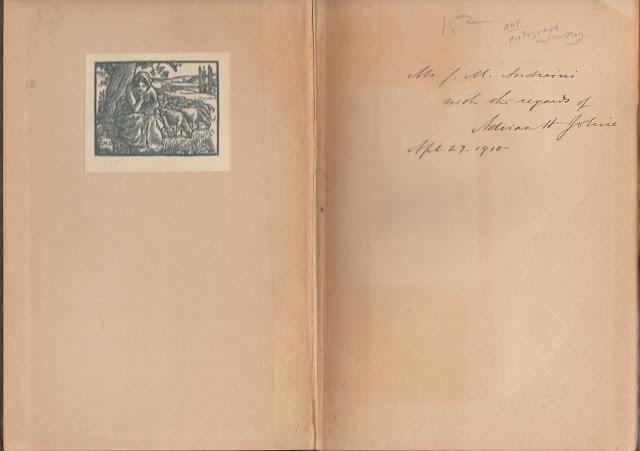 I bought this book because it was formerly owned by the Johnson/Boswell collector, Arthur G. Rippey, whose bookplate is pasted on the front free endpaper (ffep). In my library, I already had a bibliography of the Johnson/Boswell books in the Rippey Collection. 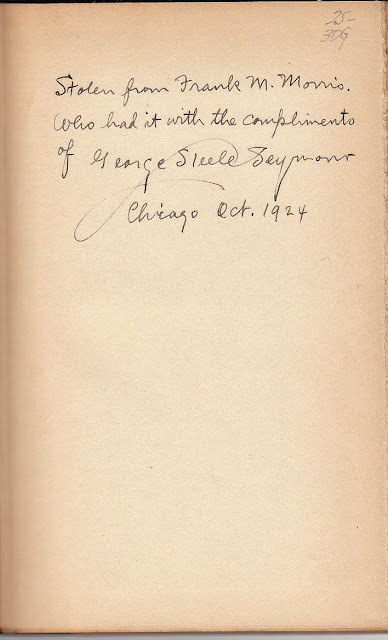 I also have his book, The Story of a Library: Reminiscences of a Latter-Day Book Collector. I'm still researching the notation written above Rippey's bookplate, "English-Speaking Union Library 1925," as well as the identity of Alexander Campbell Hill, whose bookplate is pasted on the front pastedown. I believe this copy of the book went from the English-Speaking Union Library to Hill and then to Rippey. McMaster University, the alma mater of Rippey's mother, received the lion's share of Rippey's collection. The remainder was sold at auction, which is probably where McMurtry acquired it. 2. 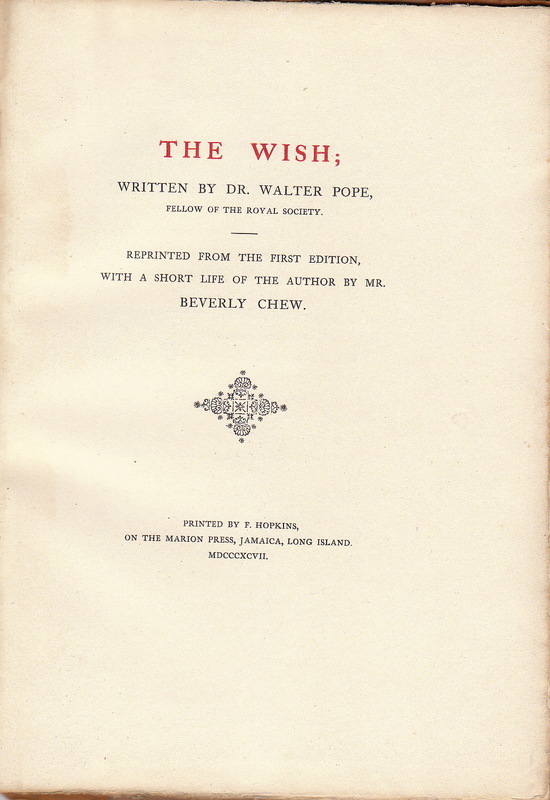 The Wish; Written by Dr. Walter Pope, Fellow of the Royal Society. Reprinted From the First Edition, With a Short Life of the Author by Mr. Beverly Chew, Printed by F. Hopkins, on the Marion Press, Jamaica Long Island, 1897. I grew up in Jamaica right by Idlewild Airport, so this book attracted my interest. The fact that the Grolier Club member, Beverly Chew, wrote a short life of the author made me want the book even more. But what really got my attention were the inscriptions. I love researching and I wanted to find out who Shackleton, J.S.W. and S–– were. 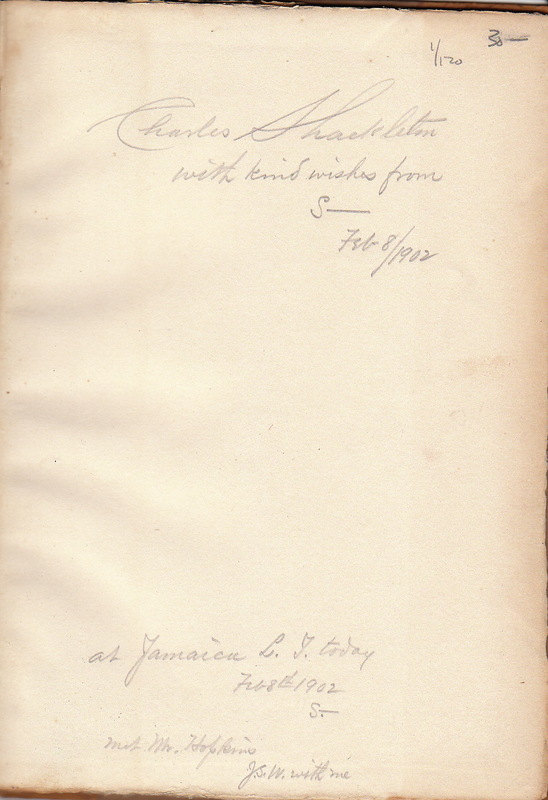 Charles Shackleton was a member of the Rowfant Club in Cleveland. J.S.W. was John S. Wood, another Rowfant Club Member. I'm still researching the identity of S––. He might be George D. Smith, the famous bookseller who had strong ties to the Marion Press. 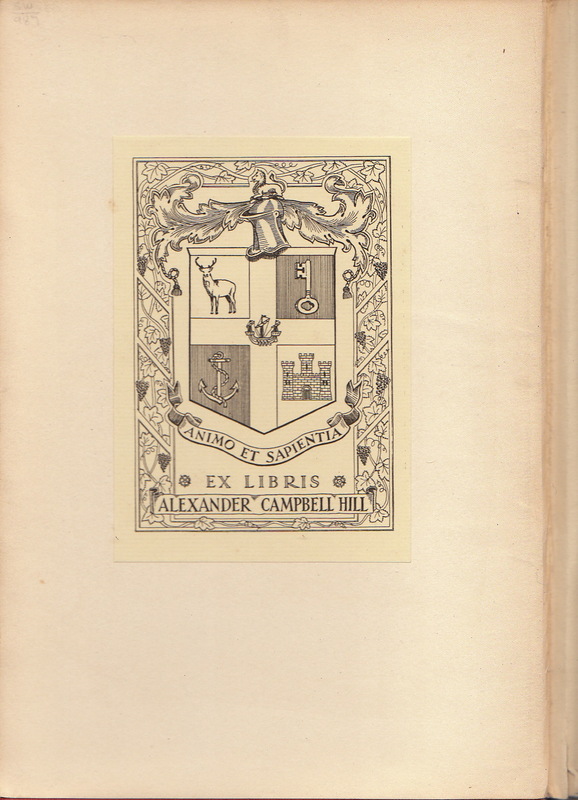 Or S–– might be a Grolier Club member who was giving visiting Rowfant Club members a biblio tour of New York. There were 18 Grolier Club members in 1902 whose last name began with S. George D. Smith was not one of them. 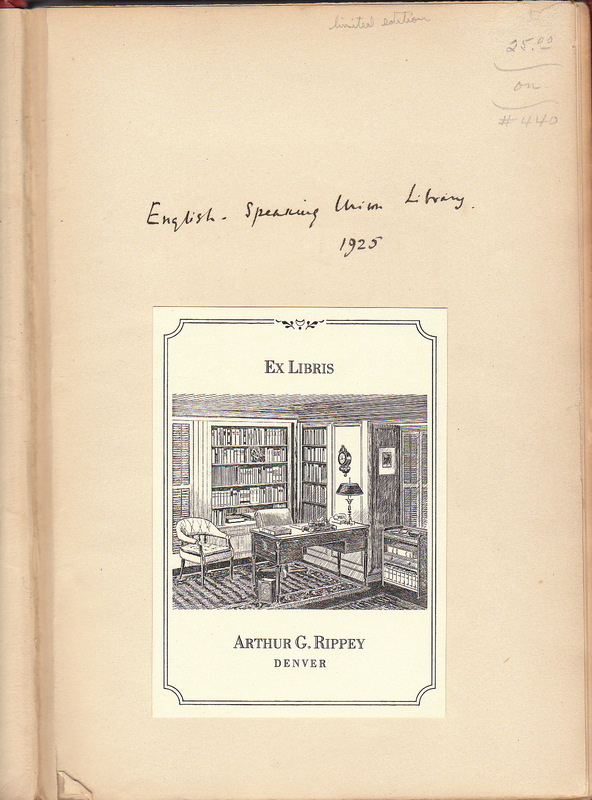 He didn't join the Grolier Club until 1918, two years before his death. 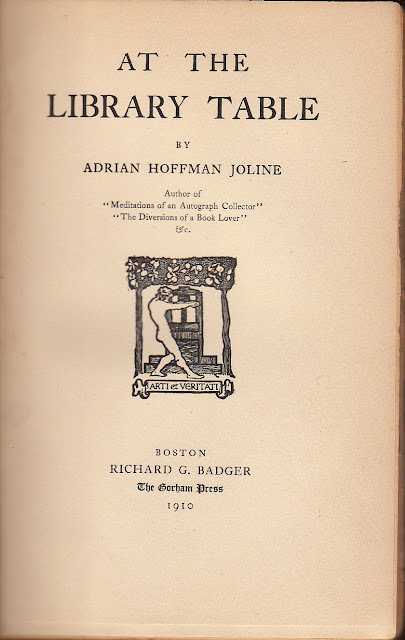 Or, as the renowned bookseller Norman Kane recently noted in an ExLibris-L reply to my query, Hopkins previously ran the fine press division of DeVinne's workshop, so S–– could be any one of a number of book collectors Hopkins knew. Update May 30, 2018: After months and months of biblio researching, I discovered who "S" was. And I wrote about it in my June 1, 2014 Biblio Researching post: Some Auspicious Biblio-Sleuthing. 3. 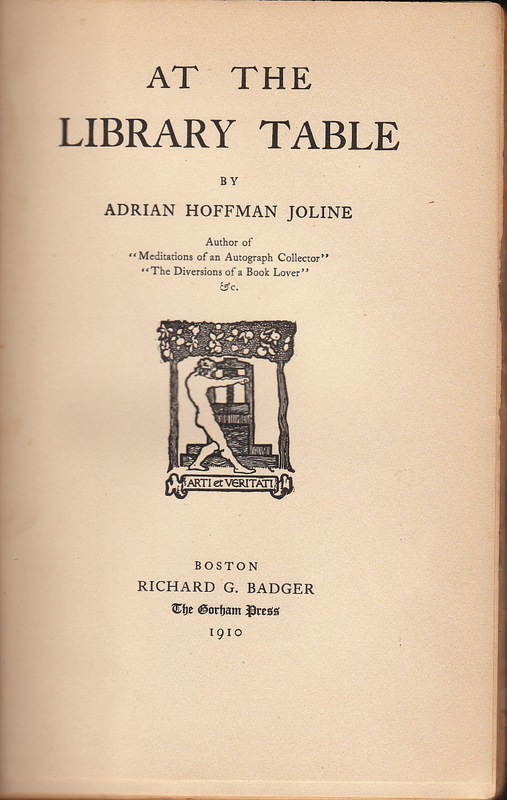 At the Library Table by Adrian Hoffman Joline, Boston: Richard G. Badger, The Gorham Press, 1910. 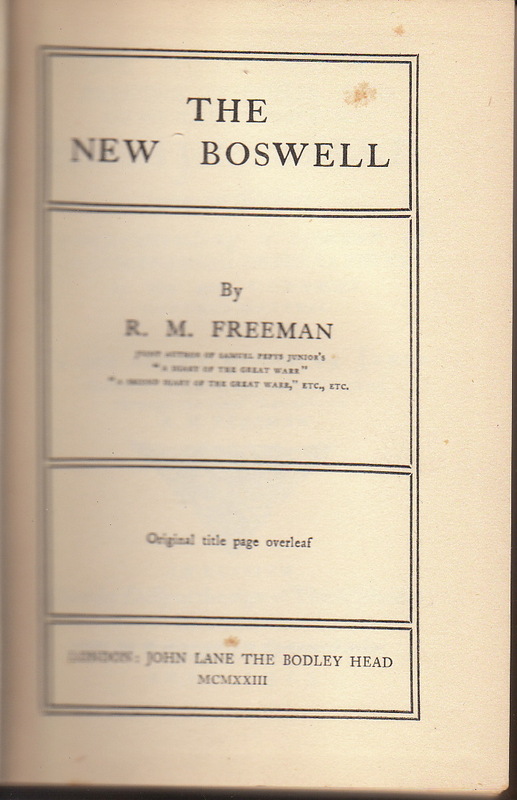 The New Boswell by R. F. Freeman, London: John Lane, The Bodley Head, 1923. 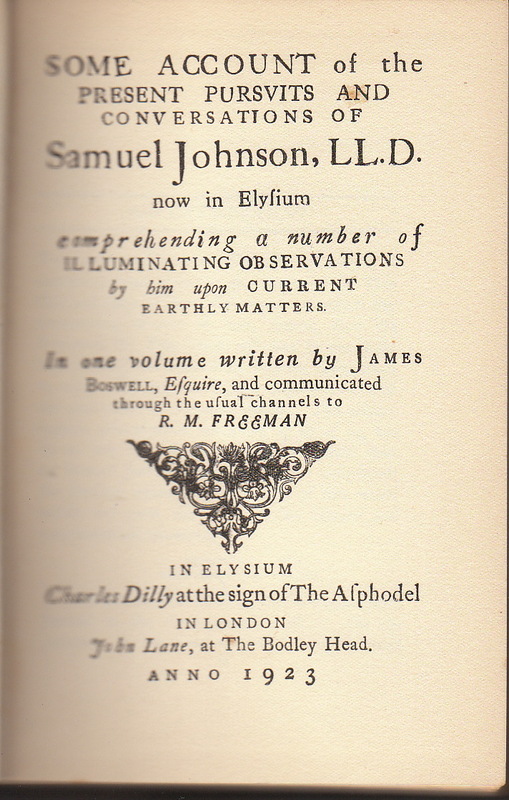 Now here is the title page that is a figment of Mr. Freeman's imagination: In the book, Johnson meets Socrates, Shakespeare, and Napoleon. 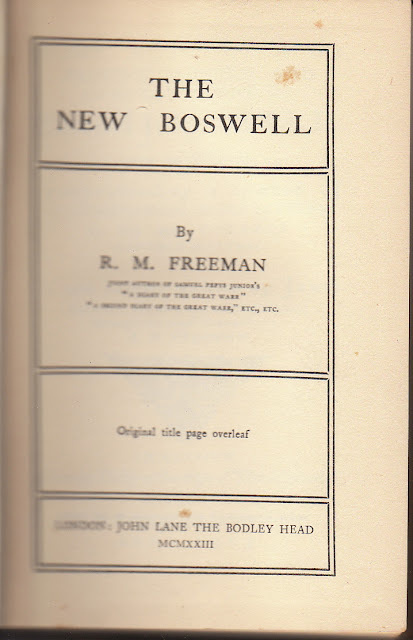 And through Boswell's communications, the author tells us about Johnson's views on a variety of subjects. The other book I had put aside was a pamphlet with a title something like "When Franklin Met Johnson." A quick glance showed that it contained a scholarly talk about when Benjamin Franklin met Samuel Johnson. I placed it on the very front of a box of pamphlets. I couldn't find the box. I had previously read that Benjamin Franklin and Samuel Johnson both attended a meeting of a London society, possibly the Philosophical Society, but I didn't think anyone knew they "met" much less conversed. I will look for it again next year. Next year? Yes, if not sooner. My son Todd, an Air Force weatherman, decided to make Texas his home after he retires in two years. He is currently having a house built in Copperas Cove, a community close to the base. The house is supposed to be ready in September. In November he deploys to Afghanistan to provide weather support for the Army. And my son-in-law just moved to Texas last weekend to work on the oil rigs! He could no longer support his wife and three children in the construction business in Florida. The rest of his family will relocate to Texas in the fall. Since two of our four children, and eight of our fifteen grandchildren will be calling Texas their home, I think we'll be visiting Texas more often. And I will manage to get to Archer City for a few days! October 22, 1962: I was a fifteen-year old newspaper boy for the Long Island Press. On this Monday night, I was ringing doorbells and knocking on doors, trying to collect money from my customers. The lights were on in almost all the houses, but no one was answering the doorbells or coming to the doors. Finally, one customer came to his door and said, "Our country is about to go to war, and here you are trying to collect money for the paper." Everyone was listening to President Kennedy on the television. He was telling the American people that Russia had placed nuclear missiles in Cuba. 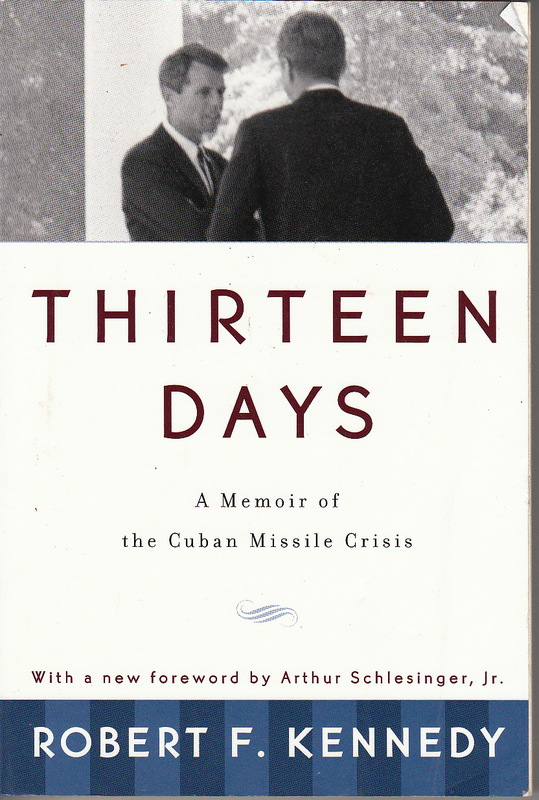 Thirteen Days: A Memoir of the Cuban Missile Crisis by Robert F. Kennedy, With a New Forward by Arthur Schlesinger, Jr. In his Forward, Arthur Schlesinger, Jr. recalls what happened at a conference on the Cuban Missile Crisis conducted in Havana in January 1992. Americans, Russians, and Cubans who were involved in the crisis attended the conference. Robert McNamara almost fell off his chair when he learned for the first time that Russian soldiers had short-range battlefield nuclear weapons in addition to long-range missiles, and were given the green light to use them during an American invasion if communications were lost with Moscow, Scary. November 5, 2009: My daughter-in-law Ana goes to the school on Fort Hood to pick up her children. She hears shooting. The school is in lock-down. No one is coming in or going out of the school. Ana calls us in Florida. My wife Linda tells Ana to take cover! We are watching it all on television. No one knows how many shooters there are. Slowly, everyone learns what happened, including my son Todd, who was in Iraq at the time and seemingly "out of harm's way."